EarthCam.com and the EarthCam Network Cameras are best viewed with a modern HTML5 web browser such as Mozilla Firefox, Google Chrome, Opera, Microsoft Edge, and Safari. There is limited support for Internet Explorer 11, and is not recommended. Our new EarthCam Network player does not officially support Windows XP, it lacks the ability to play back our stream content. The latest release of Google Chrome on Windows XP should support our new player and stream content however. Kodi is not an officially supported platform by EarthCam. We do have apps for Apple and Android however, those can be found at the links below. 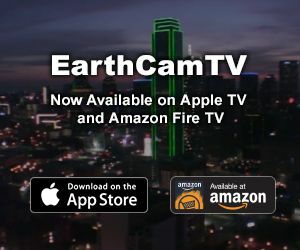 We also have developed EarthCam TV for Amazon Fire TV and Apple TV. Webcams: Available on Android, Apple iPhone and iPad. Free to download, unlock all webcams via an in-app purchase. Purchases can be restored on other devices of the same platform. Tap on the music tab, scroll all the way down, tap the button that says "Apple ID: [email protected]"
A window will come up, tap "View Apple ID"
Scroll down, tap on "Purchase History"
By default it will show the last 90 days, you can tap on the "90 Days" text to change the date range. Locate the original in-app purchase that was made to verify the purchase. If you are changing platforms (Android to Apple or vice versa), you cannot transfer your purchases, will need to re-purchase the Buy All Webcams package from the Store tab. Under the settings app, scroll down until you see EarthCam (white background icon with EarthCam logo). Go into the settings and toggle, "reset owned cameras" and "reset liked cameras". You will need to tap the Store tab and tap Restore Purchases. Please contact Apple directly regarding billing concerns as they are responsible for billing and processing payments. You may also use the link below, which can be used to request a refund for past purchases. You will need to contact Google regarding refunds, as they handle the billing and processing of payment. Google's refund policies are outlined in the link below. The link "Option 2: Request a refund on the Google Play website" contains links and directions on the refund process.